Reverse: A cross with arms of equal length, each arm devised into two parts, a dot at the end of each part. From each corner of the cross in the middle of the field extend thin lines ending in the three-dot pattern. Possible representing cross with precious stones or possibly 2 different crossed crosses with gems. Comment: Extremely rare type. Issued after Stefan Lazarevic became ruler of the Serbian Kingdom. His Christian religious orientation clearly apparent. It is uncertain if this is regular or irregular coining. Reverse: An Angel (possibly Archangel MIchael) with a granulated nimbus facing left, single wing on the right. In its right hand the angel is holding a branch with 4 buds or a sceptre, itʼs left hand is against his chest. A Latin inscription on the left half CONTE (Prince or Earl). Obverse: Christ with a granulated nimbus is depicted standing in mandorla. In his left hand he is holding the gospels, his right hand is in the ritual gesture of benediction. The initials IC XC ("Jesus Christ") at the height of his hips. Comment: Extremely rare type. Issued before Stefan Lazarevic became ruler of the Serbian Kingdom, while his mother Milica was ruling. His father died in 1389 and he was too young to rule on his own. Comment: Very rare sword type. Was only 12 when his father died in the Battle of Kosovo in 1389. His mother Duchess Milica ruled until he was old enough to take over at the age of 25. On July 19th 1427 he died from a heart attack at the age of 50. Comment: Extremely rare coin. Very scarce type. Only pictured by Jovanovic. Using CONTE like his father Lazar. Stefan Lazarević married Jelena in September 1405. Jelena was daughter of Francesco II Gattilusio, a Genovese lord of Lesbos and a sister of Irene Gattilusio, empress of Byzantium empire and a wife of John VII Palaiologos. This marriage was arranged during his stay in Constantinople in 1402, at a time when the city and the Byzantine Empire ruled John VII in the name of his uncle, Manuel II (1373-1391 ruler, Emperor 1391-1425). Jelena and Stefan had no children and Jelena is not shown on any frescoes in monasteries built by Stefan. Comment: Rare type and a rare depiction of a facing head of Christ including his full name. Rare double struck reverse. After Ottoman defeat at Ankara (July 1402) Stefan Lazarevic returned home from the battlefield via Byzantine territory; in August 1402 at Constantinople Emperor John VII Palaiologos decided to award him the very high title of Despot, second only to Imperial dignity, it gave the bearer great honour. From Constantinople, Despot Stefan paved the way for an independent Serbia. Comment: Like above but with subtle difference like wider Christ beard and different Despot scepter. 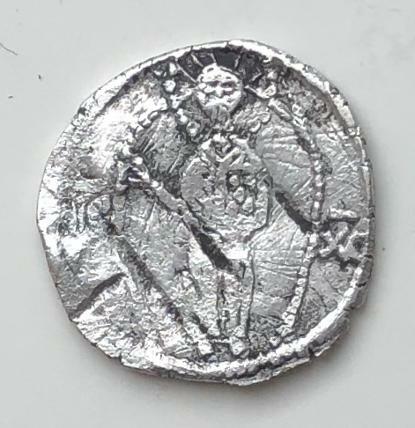 Still rare type and a rare depiction of a facing head of Christ including his full name. Under his rule, he issued a Code of Mines in 1412 in Novo Brdo, the economic center of Serbia. In his legacy, Resava-Manasija monastery (Pomoravlje District), he organized the Resava School, a center for correcting, translating, and transcribing books. Comment: Like above but with Christ more pointy beard. 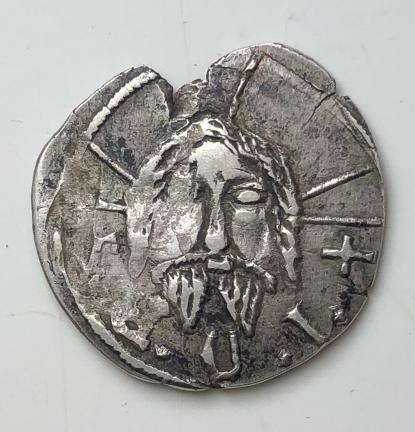 Still rare type and a rare depiction of a facing head of Christ including his full name. Stefan Lazarević died suddenly in 1427, leaving the throne to his nephew Đurađ Branković. Despot Stefan is buried in the monastery Manasija built in 1407. Comment: First depiction of two-headed eagle which is still a symbol of the Serbian State. Comment: Very rare type, from the late-19th century Rudnik hoard of Despot Stefan's, with its 1988 publication there were only 6 known examples; the present total is considered to be under 15. Like above this a a rare and early depiction of the Serbian royal symbol, the double-headed eagle. Comment: Very scarce type, associated with the late-19th century Rudnik hoard of Despot Stefan mentioned above. Probably less than 70 specimens known. Comment: Another very scarce type, like the one above but with a extra letter on the obverse and shield appear to have two-headed eagle instead of one-headed. Comment: Very scarce type, associated with the late-19th century Rudnik hoard of Despot Stefan. With its 1988 publication there total number of known specimens was brought to 65. 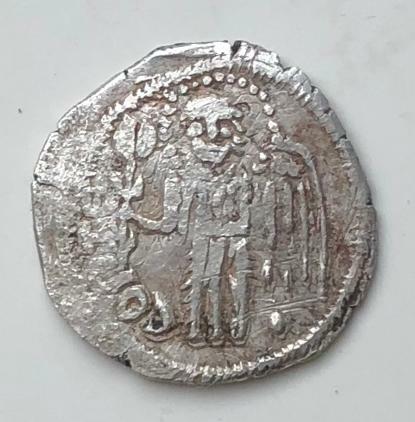 Comment: Very rare type with Despot holding labarum and Christ in mandorla combination. Despot Stefan Lazarević was a great patron of art and culture providing support and shelter to scholars from Serbia and exiles from surrounding countries occupied by the Ottomans. He was educated at his parents’ home, he spoke and wrote Serbo-Slavic; he could speak Greek, and was familiar with Latin. He was an author in his own right, and his main works include "Slovo ljubve" (Letter of Love) that he dedicated to his brother Vuk and "Natpis na mramornom stubu na Kosovo" (Inscription on the Marble Pillar at Kosovo). Some of the original works he wrote during his reign have been preserved. 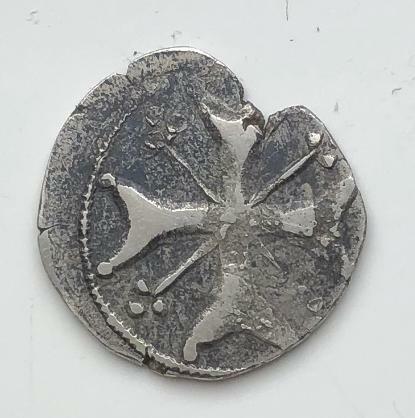 Comment: Another rare heavier coin,possibly earlier type. Comment: As the coins over time went lighter and lighter in weight this examplecould be an earlier issue. Comment: Another heavier letters only example. Stefan was receptive when Sigismund of Hungary approached him for an alliance. Despot Stefan received Mačva, Belgrade (which became Lazarević's capital in 1405), Golubac (an important fortress on the Danube) and other domains, such as lands in Vojvodina (Zemun, Slankamen, Kupinik, Mitrovica, Bečej, and Veliki Bečkerek) in 1404, Apatin in 1417 and Srebrenica in 1411. At Belgrade, he built a fortress with a citadel (which was destroyed during the Great Turkish War in 1690; only the Despot Stefan Tower remains today).